​Hi! I’m Joel Sprechman. I’m an Ulcerative Colitis patient, Integrative Nutritionist, health advocate, and healing-path pioneer. After traditional and alternative medicine methodologies were unable to effectively treat my Inflammatory Bowel Disease I became a medical researcher, health scientist, and treatment engineer driven by a quest to reverse my failing health, and well-being. As my journey led to a healing of my own IBD, I committed to sharing my story, experience, and expertise around the world with people affected by digestive disorders, and their families. On August 16, 2016 I founded the For-benefit Enterprise “One Great Gut” to continue my research and expand my contribution to the Crohn’s and Colitis community through education, collaboration and live events. 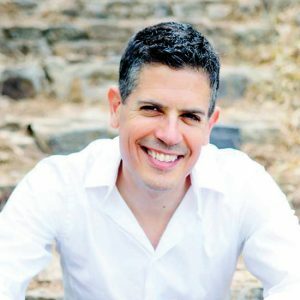 As a recognized thought-leader and highly sought-after speaker, I have been featured on TEDx, KPBS, and numerous health summits and podcasts. My passion for solving tough problems started at a very early age, inspired by my father and college professors. Fascinated by science, I decided to pursue a degree in Engineering and Computer Science, with a dream of one day using that degree to hopefully improve the lives of others. In 2001 I was diagnosed with Inflammatory Bowel Disease, specifically Ulcerative Colitis. In 2012, my health further declined with proctitis, then pancolitis, and continual flare-ups. ​I then began my medical research, and self-experimentation. My continued education includes The Gut Institute Functional, Microbiome & Nutrigenomics Medicine training, Integrative Institute of Nutrition, UCSD Center For Integrative Medicine Natural Healing Foods Cooking Class, Yoga and Meditation Teacher Trained , and over one thousand hours studying scientific journals and case studies. As an avid learner and goal-oriented student, I received the honor of Deans List from State University of New York Buffalo. I knew that my symptoms were real even though Doctor’s said nothing was wrong. I never wanted to give up. I knew all my symptoms were somehow interconnected. I felt that there must be Lifestyle factors that contributed to my condition. I knew there must be ways I could make myself feel better. There must be ways to stop the progression and turn my chronic disease from getting worse to a chronic disease that gets chronically better. I’ve been offered surgery over a dozen times, even though I knew lifestyle intervention would likely alleviate that need. I asked myself, what can I do as a person with this condition to give myself the best possible life? For 2016 and 2017 I was partnered with six Non-Profits. I donated a percentage of every purchase towards Crohn’s And Colitis Foundation Of America, Crohn’s and Colitis Canada, Crohn’s And Colitis UK, NORML, and World Hunger Program. For a dozen years I serviced the Department of Defense as both lead and field application engineer before my UC forced me to resign. I am proud supporter of the non-profit who empower the mental, physical, and spiritual health of our nation’s warriors, and their families. Here’s a shortone minute video about The Gift Of Wellness from Warrior Wellness Solutions. 97% of their finances are allocated to program expenses for warriors, and their families. eFundYourHealth is the only crowdfunding solution to match donations for alternative medicine. To learn more about eFundYourHealth, read this blog post I wrote. A percentage of every purchase from One Great Gut will be donated to Warrior Wellness Solutions. At the end of each year I will report to you how much we donated. Lifestyle interventions are often ignored by mainstream medicine. Interventions such as eliminating pathogens, addressing nutrient depletions, reducing sensitizing foods, addressing adrenal function, reducing stress and other causes of inflammation and re-balancing your microbiome can help to improve symptoms, and even reduce or eliminate symptoms. It is my sincere hope, if you have suffered from IBD Crohn’s Colitis flare-ups, constipation, loose stools, frequency, urgency, fatigue, hair loss, brain fog, weight management, dry skin, depression, muscle aches, anemia, osteopenia, osteoporosis, arthritis, pain, stomach aches, and the countless other symptoms, that your life will be changed for the better after implementing the research I’ve uncovered. It can help you do what most doctors and most clinicians would consider impossible, to put IBD Crohn’s Colitis into long term symptom free remission!